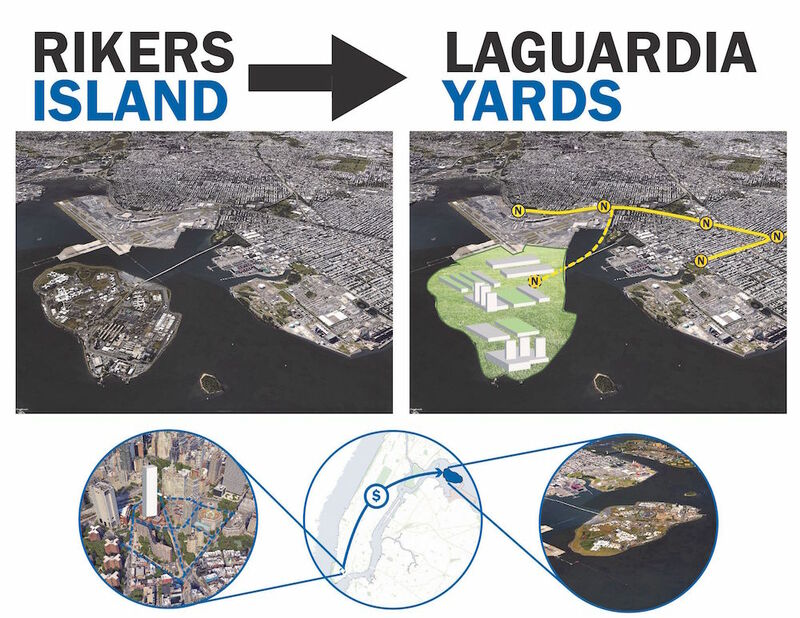 The 413-acre plot of city-owned land, most of it landfill, that makes up Rikers Island is known more for its impenetrable prison than its waterfront property and breathtaking city views. Recently City Council Speaker Melissa Mark-Viverito called for the closing of the jail complex, reports Crains, calling it an “ineffective, inefficient,” symbol of outdated policies and approach to criminal justice. An independent commission headed by Jonathan Lippman, the state’s former top judge, is creating a blueprint for accomplishing the prison’s closing. There is significant opposition to the idea, though others, from Gov. Andrew Cuomo to the New York Times editorial board are behind it. 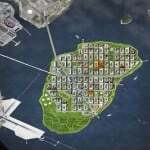 Limitations to the island’s use are many. 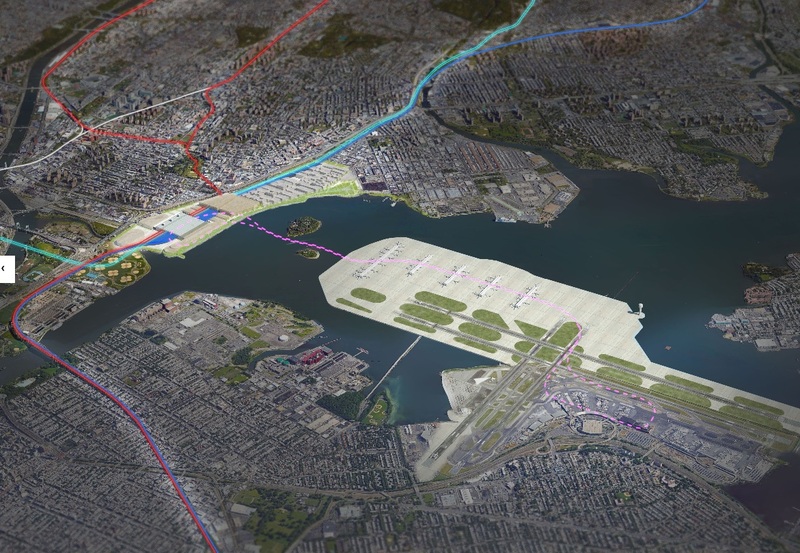 For one, it’s next to LaGuardia Airport, and between the two are a jet-fuel dump and a mudflat that stinks at low tide. 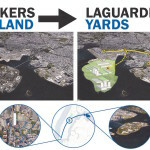 The din of airplanes taking off from and landing at LaGuardia is a constant. 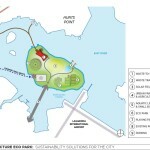 The ground could be unstable or too contaminated for some uses without remediation. Its remoteness–the reason it was used as a jail in the first place–is one of the island’s biggest disadvantages when it comes to public use. The cost of moving inmates out would reach billions of dollars. Also, a nearly $600 million facility on the island broke ground in 2013; it would have to be abandoned if the jail were closed. But those skyline views are unbeatable. Not to mention the fact that Rikers uses 80 percent of the Correction Department’s $1.2 billion budget, partly due to the difficulty of moving inmates in and out. That money, proponents of closing the jail suggest, could be put to much better use in other ways. To that end, Crains asked “architects, advocates, planners and dreamers” for their ideas on what might replace the storied slammer, and assembled a sampling of suggestions. 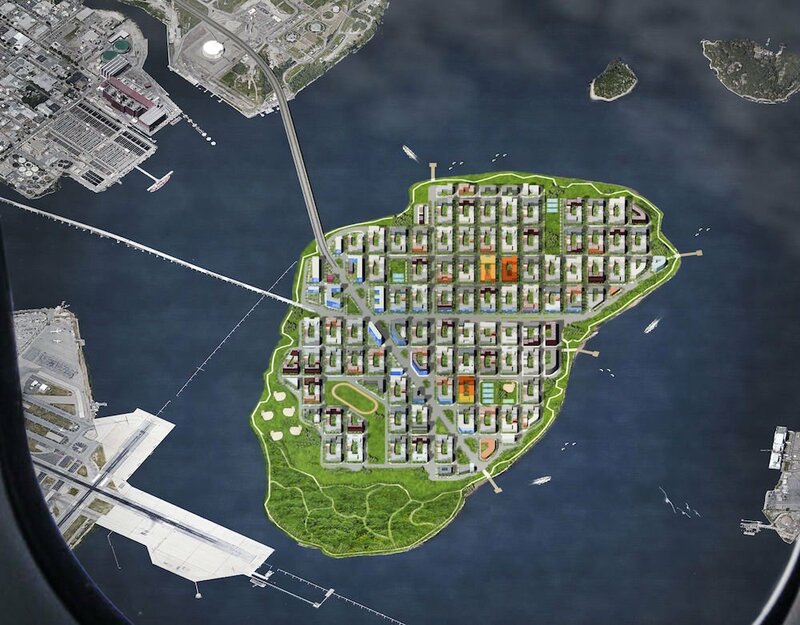 ↑ Eco Island: FXFOWLE Architects offer an eco-park with a solar-energy plant, a farm, and an education center. This could work in tandem with housing; composting is another suggestion. 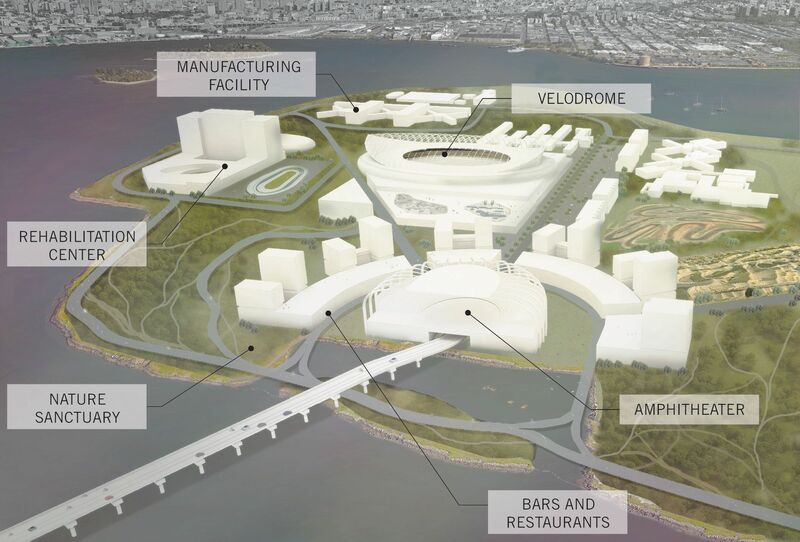 ↑ Manufacturing hub: At 413 acres, Rikers is bigger than the 300-acre Brooklyn Navy Yard. 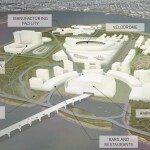 “If the city leases buildable land on Rikers cheaply enough, developers could build manufacturing facilities at rents that local firms could afford,” said Adam Freidman, executive director of the Pratt Center for Community Development in Brooklyn. Claire Weisz of WXY Studio drew up just such an idea. 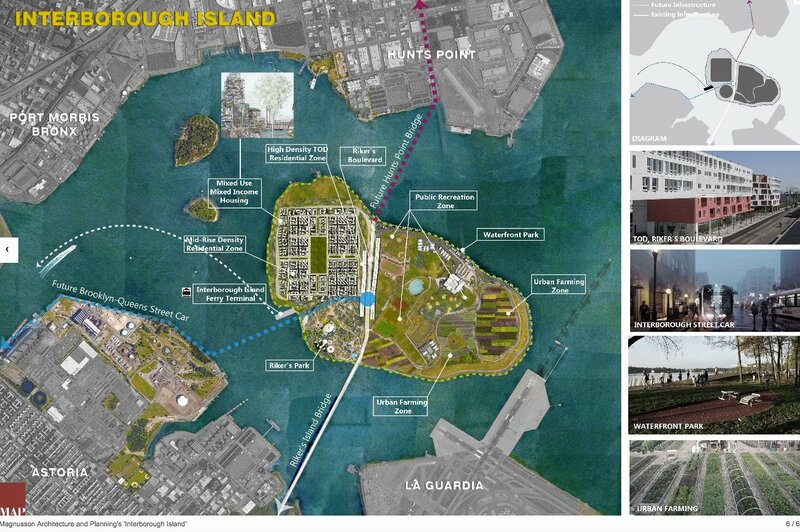 Perkins + Will’s Bikers Island. 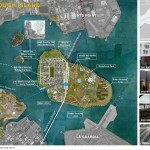 ↑ Everything Island: Magnusson Architecture and Planning envisioned an “urban smorgasbord.” Parks would be the cheapest and quickest way to reclaim Rikers Island, according to Adrian Benepe, New York’s parks commissioner from 2002 to 2012. 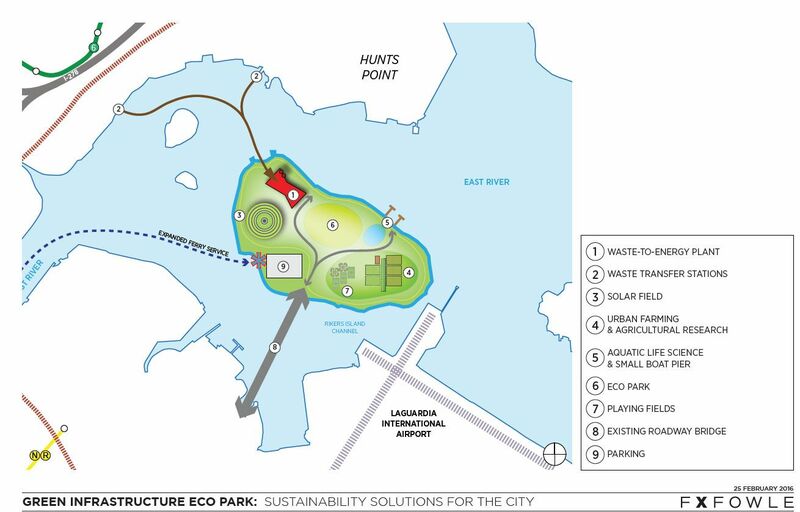 Randall’s Island, home to ball fields, tennis courts, a golf driving range, a track and field stadium, meadows and marshlands is an example of this kind of reclaimed parkland. 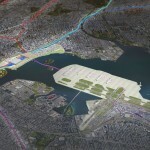 See a photo gallery of all the proposed ideas here>>.